A hydraulic jump is a discrepancy in water depths. 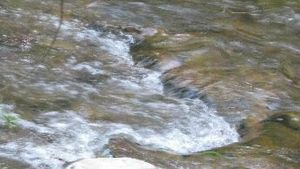 When water in a stream flows over a rock, for example, the water may reach a very high speed due to the decrease in the height of the water. (This is due to the continuity equation, (initial velocity)(initial height) = (final velocity)(final height). )* If the speed increases greatly, it may exceed the speed that waves propagate at; such a speed is called "super-critical" flow. In this case, a sudden jump in the water's height will occur so that the speed of the water is reduced to sub-critical speed. is called the Froude number, is the speed of the water, is the acceleration due to gravity, and is the depth of the water. * This is a simplified version of the continuity equation (it is not in integral form). This page was last modified on 20 August 2010, at 14:22.